Autumn Show: Ready for a spot of friendly competition? It’s time for the Horticultural Society’s Autumn Show, so do join in, or at least pop along and see the lovely displays. There are Vegetable, Fruit, Flower, Flower Arranging, Domestic and Photographic Sections so even if you don’t grow anything at all, you can join in the fun. Access the schedule via the village website northiamvillage.co.uk – all the Village Societies are listed. Or phone Alison Kirk 01797 252525 or Claudia Barbera 07802 989769, Joint Show Secretaries (who can also give advice if you’ve never done it before). Committee members are always available to help with your entry – just take it to the Village Hall between 9 and 10.30am on Saturday 8th September with your 20p fee. Viewing starts at 2pm. Rye Ancient Trail: The Rye Ancient Trails is a scenic and challenging 30k multi-terrain race, taking place on Sunday 9th September 2018 at 9.30am, and will be passing through Northiam – so do look out and cheer the runners. Starting and finishing in Rye, the single-lap route winds its way through ancient woodland, orchards and farmland on trails, footpaths and quiet country lanes, linking the Norman churches of Rye, Iden, Beckley, Northiam and Peasmarsh – a true steeplechase! The event is organised jointly by local race management company Nice Work and Rye Runners raising money for the Oliver Curd Trust (Charity No. 1124648). 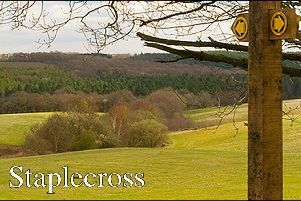 Runners can enter online at ryeancienttrails.com or on the day at Race HQ located behind Rye Sports Centre. We are also appealing for volunteer marshals, please email info@nice-work.org.uk for more information. Bonfire Society: The next meeting of Northiam Bonfire Society will be in The Rose & Crown, Beckley at 7.30pm on Monday. We are about to have an exciting couple of months, not only the Bonfires starting up each weekend (ours is on October 20th) but also our 10k run on 16th September and a Craft Fayre on 22nd. If you are interested in joining the Society, do come along and meet other members. Women’s Institute: The WI meets in the Village Hall on the second Tuesday of each month 2-4pm. This week, the speaker, Cliff Dargonne, will talk of Adventures on the Ice, and there will be a competition of A Snow Scene. Talk about wishing away the heatwave! Guests are always welcome. Fashion Show: There will be a Fashion Show in the Village Hall on Thursday 13th September in aid of Family Support Work. Travelling Trends bring high street ladies’ clothing and accessories, with this season’s fashions at greatly reduced prices. Tickets are available from me and cost £5 to include a welcome drink. Clothing will be sold on the night so bring your money or plastic! Phone me 253375, contact via facebook or karen@terenceayling.co.uk for your tickets – we need to have sold advance tickets so they know how much stock to bring. Parish Council: The next meeting of the Parish Council will be held in the Jenkins Room of the Village Hall on Thursday 13th September at 7pm. The meetings are open to all parishioners. Rother Valley 10k: Although there is the challenge of a couple of hills, the route between Northiam Station and Bodiam Castle is a great way to spend a Sunday morning! As it’s the second year for Northiam Bonfire Society’s 10k run, there will be £50 prizes for beating the course records - the current Men’s record is 34 minutes 30 seconds set by Gary Foster and the Ladies record is 40 minutes 53 seconds set by Sarah Roff, both from Hastings AC. The km marks are on the route, so anyone wanting to test themselves beforehand can do so. Register with rothervalley.co.uk to take part on Sunday 16th September - 10am. If you are on the routes for these races, do come out and cheer on the competitors, it really makes a difference and is much appreciated. Scams: There are a lot of scams about at the moment – phone calls from very persuasive people saying they’re from HMRC, emails from HMRC and the emails asking for help in freeing up money in foreign bank accounts have now morphed into printed letters coming through the post. Ignore them. Please. And I include in this the mailshot from Pharmacy4U which comes emblazoned with an NHS logo which makes you think it’s official. If you are in doubt, ask someone else’s opinion, and we all know that no-one is going to give us money for nothing, so if that’s what’s on offer give it a wide berth.